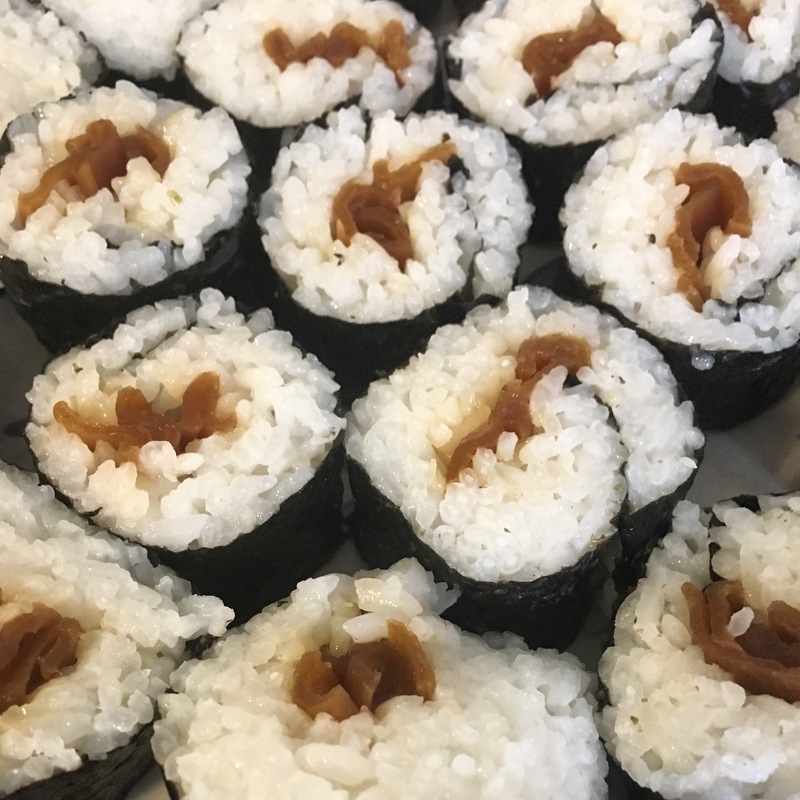 My grandmother taught me how to make nori maki and I have been her assistant a few times. However, today was my first day making it alone. Nori maki is made up of a sheet of roasted seaweed that is then filled with rice and desired vegetables or fish. My grandmother fills her nori maki with either Japanese gourd (Hime Makizushi No Moto) or cucumber. The Japanese gourd is hard to come by in some areas. You can purchase it on Amazon but it is very expensive. Some Japanese and Asian markets carry it in stores for a much more reasonable price. If you need an actual demonstration of how to roll your nori maki check out this video, How To Make Nori Maki by Famous Cuisines Channel. If you use too much rice, the 1/2 inch of seaweed you leave free will not be able to stick to the outer seaweed and hold the roll together. I overfilled a few times. 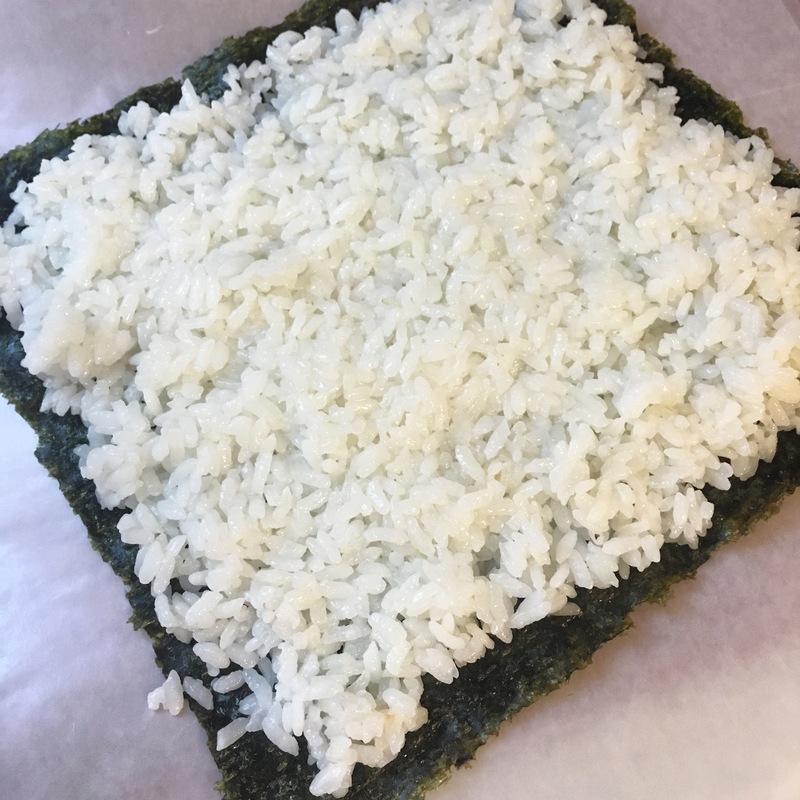 I used a knife to run along the edge of the seam to clear off the excess rice and then dipped my finger in rice vinegar to gently stretch the free portion of seaweed toward the outer seaweed and reseal. Place rice in cooker bowl or pot and fill with water, just covering the rice level, to rinse/wash rice. Drain. Fill rice cooker bowl or pot with water (amount according to rice package), cook rice according to package. When rice is done, place hot rice in large container (I used a round plastic container) and begin to fold in rice vinegar with spatula and use a fan to cool rice (recommended but not required). Dampen a cloth or paper towel and place over container for five minutes. Roll out wax paper and fold so that you have about a foot, three sheets thick. Pour small amount of rice vinegar in small bowl. Place nori sheet rough side up. Spread ¼ cup of the rice over the surface of 1 nori sheet, leaving ½ inch empty, trying to not smoosh rice too much. Place strips of gourd or desired ingredients in the center of the sheet. Dip ring finger in small bowl of rice vinegar and gently dab the 1/2 inch of nori you left empty. This will allow the end of the roll to stick. 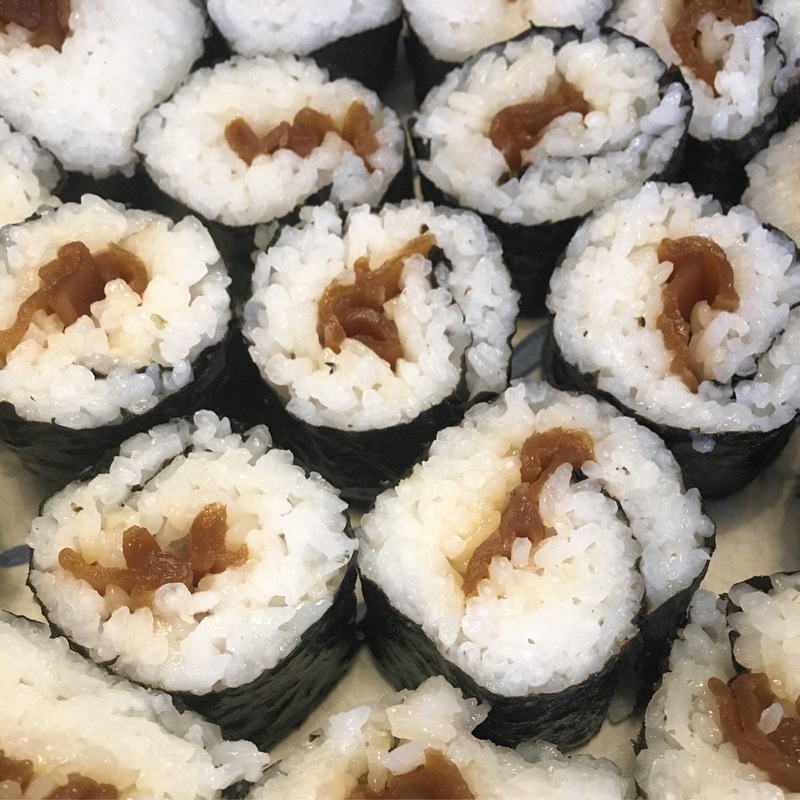 Begin rolling the edge of the wax paper closest to you, using the wax paper to press down on the sushi roll firmly. You are trying to make a “squarish” shape, not round (using ring finger to run along the side of the roll while thumbs run at the top). Continue rolling, keeping the roll tight, allowing the end of the roll to stick. Set roll aside and repeat. Dip a serrated knife in the small bowl of rice vinegar and cut rolls in to pieces. The ends of the nori will not look super pretty (I typically eat those while working and save the pretty rolls for serving).